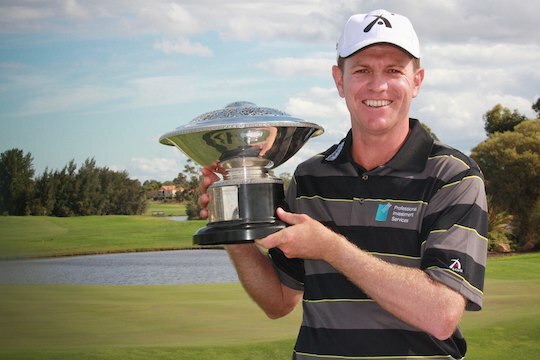 37-year-old Queenslander Michael Wright has taken out the 2011 Brunel West Australian PGA Championship by one shot over Terry Pilkadaris in a dramatic finale at The Novotel Vines Resort and Country Club. Wright battled it out with Pilkadaris till the very last hole where he chipped out from a greenside bunker to putt for birdie and claim the win and the $16,500 winner’s cheque. The win for Wright now guarantees him a spot in this season’s biggest tournaments including the Emirates Australian Open, Australian PGA Championship presented by Coca-Cola, BMW NZ Open and the JBWere Masters. For Pilkadaris it was again a case of ‘oh so close,’ this tournament his third second place result in three consecutive PGA Tour of Australasia tournaments. “I am comfortable being in the lead but it has been a bit frustrating not finishing it off,” said Pilkadaris who finished second in the South Pacific Open and the Queensland PGA Championship. Andrew Martin capped off a great tournament with a final round of 68 to claim third position at 12-under par, while a fast finishing Max McCardle (65) and James McLean (66) tied for fourth at 11-under par. The PGA Tour of Australasia now moves to Royal Fremantle Golf Club for the highly anticipated John Hughes Geely Nexus Risk Services WA Open Championship which will tee off from 27-30 October.